Feast. 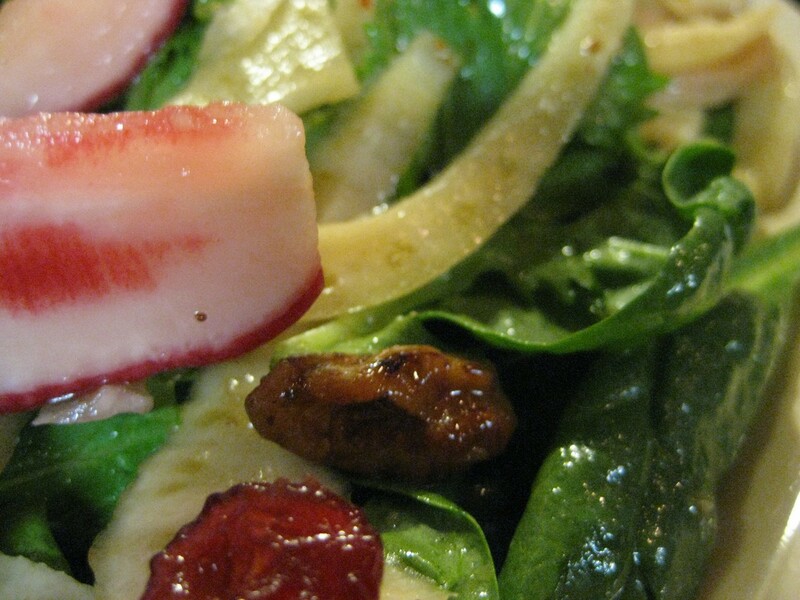 In July, The $12 Salad + Pork belly. In September, the Chego-man BBQ Bowl. Chego was my friend’s find that has proven itself to be a pretty reliable source of fun, tasty food. Bored? Hangry? Hungry? Tired? Chego’s always on the menu. Rain, shine, sleet, snow, alien invasion, zombie apocalypse. Chego’s it. They’ve recently revamped their menu (got rid of some of the old stuff/took away my favorite salad. Angry fist. Sadface. (There’s some kind of unhealthy love hate thing going on there)). 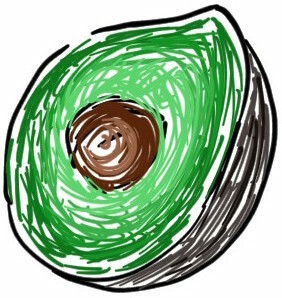 But the memory and taste of the salad will live on within my head and last forever. And so do pictures. This salad needs a theme song and a hymn. 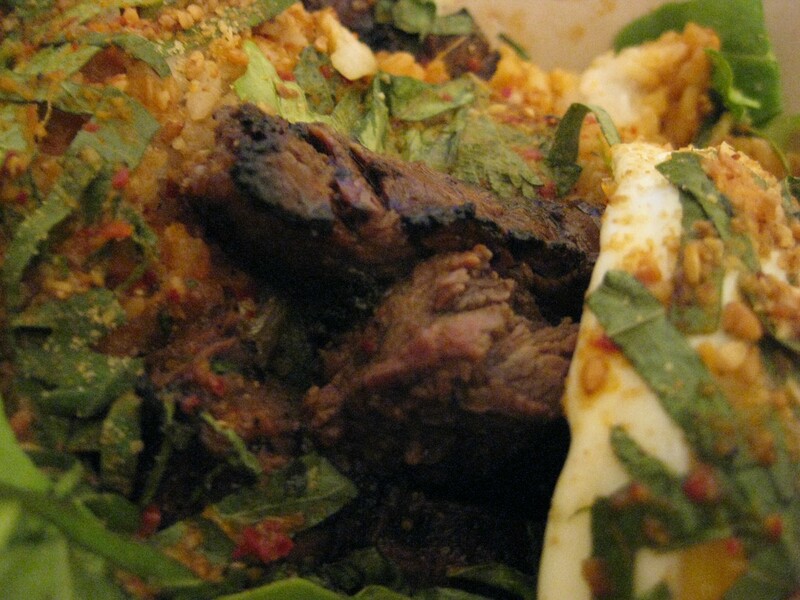 The Chego-man BBQ bowl was quite the surprise, since the ingredient list didn’t seem to long. Some rice, some Korean skirt steak, and some marinated romaine leaves gig. Quite simple, but the entire meal resonated “soft” to me. The rice was soft and fluffy, the steak was tender and juicy, and the romaine didn’t quite give off a crunch. The meal could be described as comfort food. Easy to eat, didn’t blow away the senses but was definitely warm, gooey, and pretty damn good. They obviously didn’t screw up the steak; the greens could be made soft relatively easily by some simple sautéing. Meat. Rice. Veggies. Herbs. The food groups of being manly. But the rice? There were a myriad of ways that that could’ve went wrong. Cooked too long, cooked too little wrong type of rice, incorrect preparation…the list goes on. Crappy rice could’ve sacked that meal pretty quickly. Nothing like hard, chalky bits of hard grain playing archaeology with your teeth. At the same time, I wouldn’t want a risotto in my Chego-man BBQ bowl either. Research suggests that washing rice has the benefit of reducing trace amounts of arsenic, as well as histamines (allergy-inducing molecules) that may aggravate certain forms of dermatitis. Research aside, I’ll take the extra minute or two to rinse my rice instead of keeling over later. In some traditional cultures, the uncooked grains of rice are sautéed/browned with a neutral oil or ghee (clarified butter) before the rice is cooked. The purpose of doing this is to create Maillard products that will ultimately influence the final flavor. Unfortunately, you can’t turn white rice into brown rice. To do that, you would have to find empty rice-bran hulls and do a re-un-polishing. Which doesn’t make sense. Cooking the rice (boiling in water). Starch granules begin absorbing the water, and eventually reach a gelatinization phase (but no gelatin is involved. See previous post Depending on the type of rice, the ratio of amylose to amylopectin will vary, which will generate different results. Different ratios of amylose and amylopectin will require the user to carefully understand how much water to use, as well as how the rice behaves post-cooking and during reheating. Amylose is a relatively long chain of glucose (approximately 1,000 molecules) and is a straight chain with several branch points. Amylose, in general, needs more water and longer heating times to reach the gelation phase. Amylopectin contains a larger amount of glucose (5,000 to 20,000 molecules) and is highly branched (more bulky). Amylopectin generally needs less time and water to reach the gelation phase (less bonds to break). Slender amylose can bond more times "lengthwise." Fatter, branchier amylopectin, well, he might need to shop for some bigger clothes. Short grain rice usually has 15% amylose. Sticky rice, the kind you pick up with your chopsticks. Soft. Long grain, 20% amylose. More “individuality” to the grains. Need a spoon. Somewhat chewy. 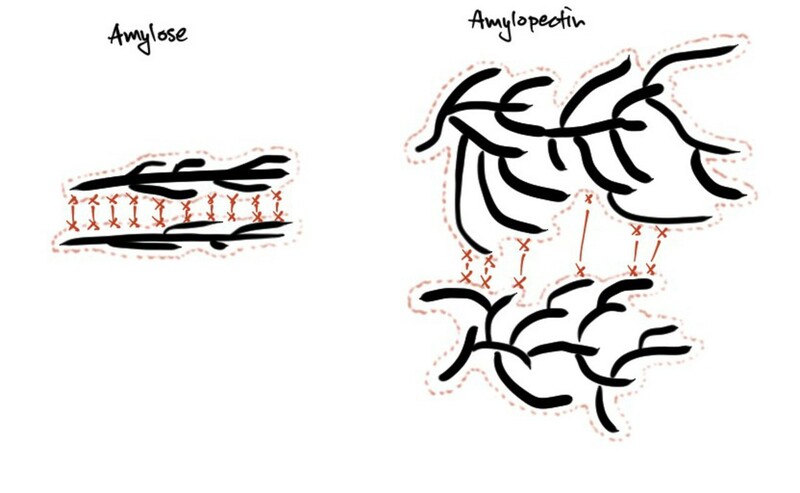 Bonding surface area explains the differences between amylose and amylopectin. Notice the contact points for bonding (red x’s, above). Taking a fork to the rice breaks up larger chunks of rice, and allows the steam to evenly distribute throughout the rice, otherwise it’ll all just come out as one big ol’ mass. Think of it as just stirring, breaking it up, so the gelation doesn’t go too far afield. Be sure to re-lid it and let it sit around in its new conformational state. Hard leftovers in the refrigerator is everyone’s nightmare. We call this action “retrogradation.” When rice cools, the bonds made by amylose and amylopectin are able to form more easily, creating highly organized structures. Millions of these highly organized structures, along with evaporation of water from the rice, is what renders nice, fluffy cooked rice into a hardened ball of meh. These highly organized structures can now resist boiling temperatures, so don’t even try to call your re-boiled-steamed-microwaved-day-old rice “fresh.” Cause’ its not. And it never will be again. Uncooked, to cooked/eating phase, to "time to hide the leftovers." But all is not lost. Throw it in a wok with some oil n’ spices, make fried rice, or make chicken and rice porridge. No one will know.